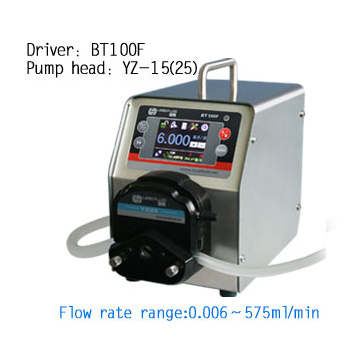 BT100F Intelligent dispensing peristaltic pump flow range: 0.00011-720ml/min. It adopts color LCD touch screen with intuitive and clear displaying interface, easy to operate. Mainly used for accurate measurement and distribution of fluid. If need high accuracy when dispensing, volume dispensing mode is available; if need high producing efficiency, time dispensing mode is more convenient; if want to separate fluid to number of equal parts, copy dispensing mode would be best. When working on flow mode, it is as same as intelligent flow peristaltic pump. The pump adopts intelligent temperature-control technology to reduce working noise. RS485 interface, as adopting the MODBUS communication protocol, the pump is easier to be connected with other equipments, such as computer, human machine interface and PLC. • Communication interface： RS485 communication interface, MODBUS protocol is available.